Peppers: Some Like it Hot! Some Like it Even Hotter! Peppers, sweet and hot, were first cultivated in Central and South America over 2,000 years ago. They were introduced to Europe when Christopher Columbus brought them back with him to Spain after his first voyage to the New World in 1492. Most believe that Columbus named the plant, calling it “pimentito” or “pepper”, out of a mistaken belief that he had discovered black pepper. Peppers then made their way via traders to India and Southeast Asia and China. What makes a pepper hot? 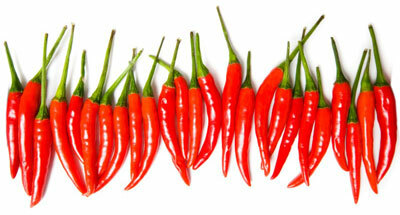 Capsaicin (pronounced kap-SAY-sin) is the compound that makes a pepper a chili pepper and gives it heat. Up to 80% of a hot pepper’s capsaicin is located in the seeds and the white membranes, so if you’re sensitive to heat, trim these parts off. Generally, the larger the pepper, the milder the heat. One raw medium pepper contains 19 calories and is an excellent source of Vitamin C and folacin. The capsaicin in peppers is believed to lower blood pressure and high cholesterol. The “heat” is measured in what is known as Scoville Heat Units (SHU). Here is a guide of what to expect from some of the more popular kinds of chili peppers harvested this fall. Jalapeños (SHU: 2,500-10,000 – mild to hot) are one of the most common chili peppers. Usually green, they are great for those who like a bit of heat, but not too much. A popular dish is stuffed Jalapeños with cream cheese. Other favourites include salsa, pickled, stuffed and deep fried. Chipotle peppers are made out of smoked, ripe jalapeños. Serrano (SHU: 10,000-25,000 – hot) are a spicier cousin to jalapeños. They often are used as substitutes when more heat is desired. The most common colour is green, but they can also be red, brown, orange or yellow. Commonly used in salsa, guacamole and as a pizza topping. Del Arbol (SHU: 50,000-65,000) are the peppers you see dried and hung in garlands. They are a deep bright red even when dried. The drying process actually makes them stronger. Their smoky and acidic heat make them good for Indian, Szechuan (Chinese) and Central American cuisines. Tien Tsin Peppers or Chinese Red Peppers (SHU: 50,000 – 75,000) are the surprisingly hot, dried chilies usually used as a flavouring that are removed prior to serving (unless you order your meal extra hot). The Tien Tsin pepper’s small body, long form and big heat also make them terrific infusion chilies for oils, vodkas and other beverages. Habaneros (SHU: 100,000-350,000 – extremely hot) look like mini bell peppers, but these little guys pack heat! They can be orange, red, white, brown, or purple. Their bright, fruity flavours are perfect for salsa (extra hot) and hot sauces. Scotch Bonnet (SHU: 100,000 – 350,000) is considered the pepper of the Caribbean islands, 12 to 140 times hotter than the Jalapeño. This sweet but very hot pepper is used in Caribbean cuisine, including jerk chicken or pork.